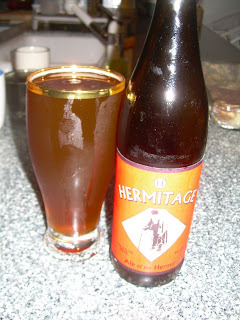 The last Hermitage beer I had was Hoptopia, which I was not blown away by; it was OK. Sidenote: Hermitage contract brews for BevMo, and is the reason you always see Coastal Fog beer there. This is definitely a step up in their arsenal. It's the kind of ale Sam Adams wishes they could produce. At 8% abv the ale is a little too strong for it's own good; it's reminiscent of a not-quite-there homebrew. I would buy this again, and I hope Hermitage works on the recipe. If they do this could be world class.